Do You Know Your Yin from Your Yang? Living in China and having a long personal history of martial arts, Chinese history, culture and my own spiritual practice embedded in China for the past fifty years, has; over the years made me very interested in Daoism/Taoism, Lao Tzu/ Lao Zi, the Dao De Jing/Tao Te Ching, I Ching..there are so many ways they are represented globally 🙂 The difference between Daojia 道家 , Taoist Philosophy and Daojiao 道教, Daoist Religion brings even more confusion to the western world let alone understanding the I Ching (The Book of Change), the oracle of fortune, a guide to success and a dispensary of wisdom. 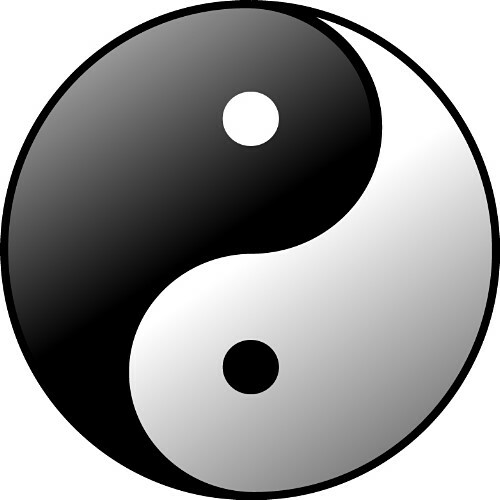 The ancestor of all Chinese philosophy, it is the primary source for the pragmatic mysticism of the Tao Te Ching, the rational humanism of Confucius, and the analytic strategy of Sun Tzu’s Art of War and of course the wonderful Yin 酓 Yang 昜 in traditional Chinese and Yin阴Yang 阳 in modern simplified Chinese. Yin is the black side with the white dot in it, and yang is the white side with the black dot in it. The relationship between yin and yang is often described in terms of sunlight playing over a mountain and a valley. Yin (literally the ‘shady place’ or ‘north slope’) is the dark area occluded by the mountain’s bulk, while yang (literally the ‘sunny place’ or ‘south slope’) is the brightly lit portion. As the sun moves across the sky, yin and yang gradually trade places with each other, revealing what was obscured and obscuring what was revealed. Yin is characterised as slow, soft, yielding, diffuse, cold, wet, and passive; and is associated with water, earth, the moon, femininity , and nighttime. Yang, by contrast, is fast, hard, solid, focused, hot, dry, and aggressive; and is associated with fire, sky, the sun, masculinity and daytime.